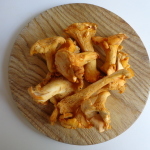 Chanterelles can be expensive, but they are the star of the dish so go ahead and buy the amount given below if you can afford it. 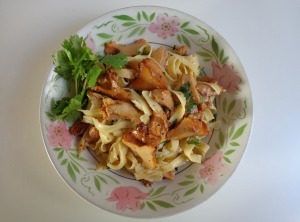 If not, there are two solutions: use fewer mushrooms, or combine the chanterelles with another type of mushroom. This dish takes about 15 minutes to prepare, and the first step — cooking the mushrooms — may be done up to an hour before you plan to serve. 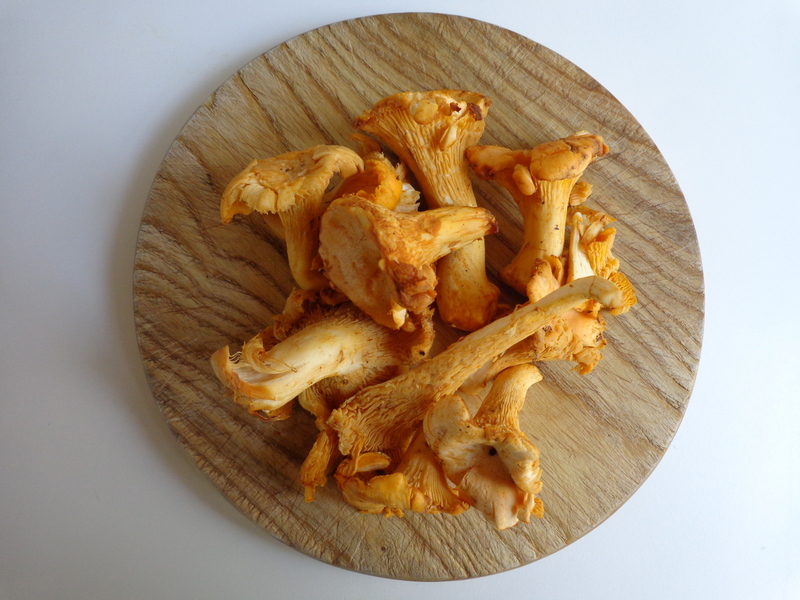 First clean the chanterelles. If they’re already quite clean, you can simply brush them off with a pastry brush. But they often come with traces of the forest attached. In this case, fill the bottom of a salad spinner with lukewarm water. Gently immerse the chanterelles in the water very briefly, rub away any dirt or leaf fragments, then transfer them to the spinner’s basket and spin to remove as much water as possible. Transfer to paper towels and gently pat dry. Trim off any remaining vestiges of the forest. Cut the larger mushrooms in halves or quarters. Heat the olive oil to sizzling in a heavy-bottomed pot or skillet. Add the chanterelles and the garlic halves. Cook, stirring occasionally, until the mushrooms have given up and re-absorbed their juices, about 10 minutes. Season with salt and freshly ground black pepper. Taste and adjust the seasonings as necessary. Discard the garlic. Set aside. Shortly before you plan to serve the pasta, bring a large pot of water to a boil. Add the sea salt and the pasta and cook for 2-3 minutes, until just tender. Drain through a colander. Heat the cream to a simmer in a fresh pot. Add the pasta and mushrooms and heat through, stirring. Season to taste with salt and pepper. Snip the herbs into the pot and stir. Serve piping hot in individual shallow bowls. Serves 2 generously.